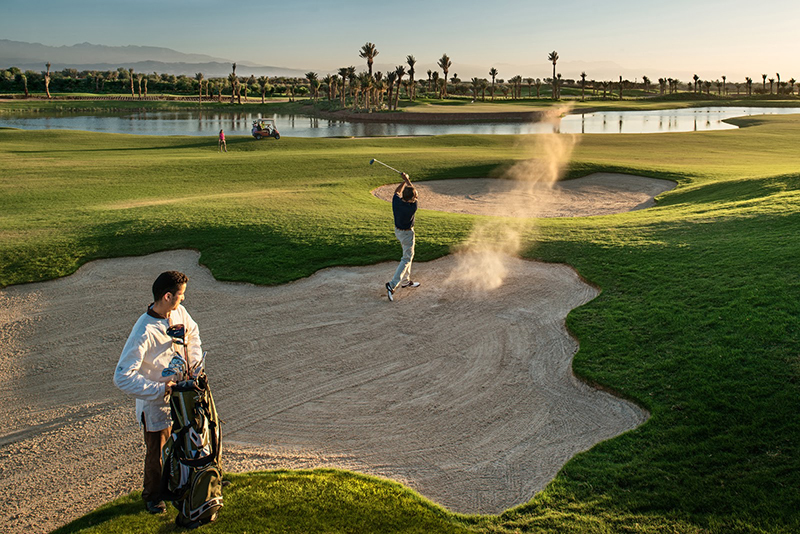 With world-class courses and the perfect climate for low season playing, Marrakech is a great destination for a short golfing tour. 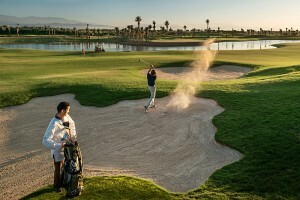 Furthermore, as Marrakech is well served by budget airlines, the red city is becoming an increasingly popular option for a golf holiday. There are five excellent 18-hole and 27-hole golf courses within a short 20 minutes drive from the heart of Marrakech. 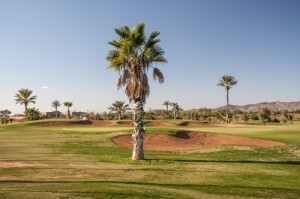 Each course is set against the backdrop of the Atlas Mountains and boasts a rich a varied landscape, stunning views, and an impressive range of facilities. The Royal Club: Marrakech’s oldest golf club (opened 1923) boasting narrow picturesque fairways and a recent 9-hole extension. This course is easily walkable at 5900m with nice flat terrain. The Palmeraie: a 6,214m parkland course set in a beautiful olive grove with several acres of lakes. Amelkis: a course specially designed by Cabell Robinson which features open fairways, extensive shallow sand features and many water hazards. Samanah Country Club: designed by the Jack Nicklaus company, this wonderful course has become a firm favourite amongst all those who visit Marrakech for the ultimate golfing experience. Noria Gold Course: This stunning new golf course has 3 distinct loops of 6 holes with a range of landscape experiences – Garden, Orchard and Dune. The central feature is a magnificent traditional ‘basin’ that splits the 18th green and stretches away into the distance from the clubhouse to the far side of the site. A wonderful challenge for all levels of golfers. 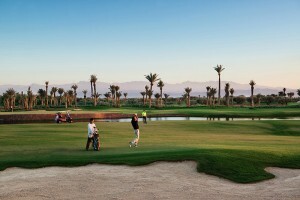 Atlas Golf Marrakech: This 9-hole golf course is perfect for a short round of golf on your arrival or departure day. 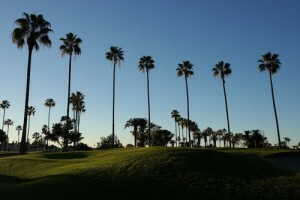 Al Maaden Golf Resort: this majestic course located right next door to the Royal Palace. 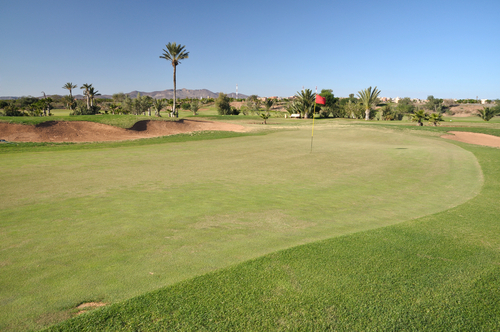 Al Maaden offers two large water features, cavernous bunkers and uninterrupted views of the Atlas Mountains. Golf holiday-makers can opt for a luxury base in one of our traditional Moroccan riads, providing immediate access to all the city’s restaurants and attractions. As well as accommodation, we can arrange transfers to and from the courses, pre-booked tee times, golf equipment hire and on-course meals. 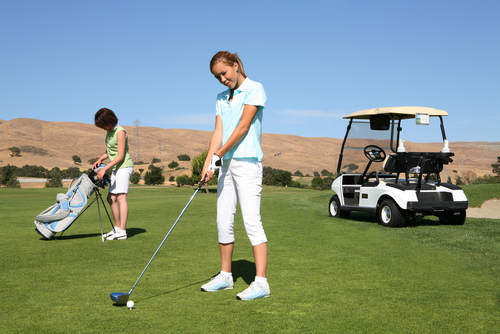 We can cater for golfing breaks for small groups and larger societies; size is not an issue.